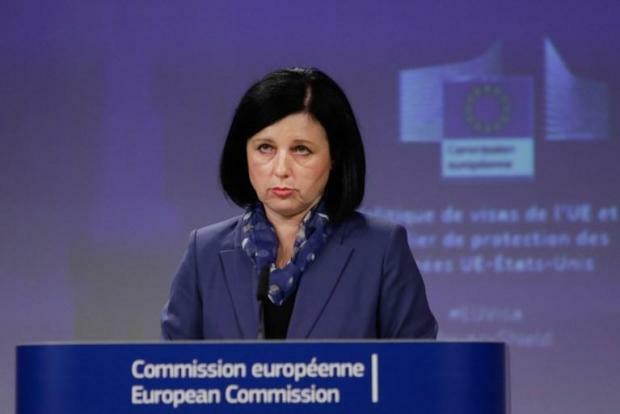 EU justice commissioner Vera Jourova. The European Union urged member countries on Wednesday to crack down on schemes granting "golden visas and passports" to foreign investors, warning they can bring corruption and money laundering in their wake. The European Commission, the EU executive, published a report urging members to curb the practice of giving foreigners -- often Chinese, Russians and Americans -- residency or citizenship in return for investment. "We speak about opening (a) golden gate to Europe for some privileged people who have the money to pay for citizenship or residence," EU justice commissioner Vera Jourova said at the report's publication. "We are looking at it with concern," Jourova told a news conference in Brussels. The commissioner said investor residence and citizens schemes, known as "golden visas and golden passports," should not be a weak link in EU efforts to curb corruption and money laundering. The bloc's laws are important as a citizen of one EU country has the right to travel to others, exercise economic activities within the 28-nation internal market, and vote in local and European elections. "Crime has no borders," said Jourova, a Czech politician. The Commission complained that Bulgaria, Cyprus and Malta run schemes granting foreign investors citizenship without requiring them to live in those EU countries or show "genuine connections" to them. The investor citizenship schemes, known as "golden passports," offer less strict requirements than those for foreigners seeking to become naturalised citizens. An EU residence permit gives a third-country national the right to live in the member country and to travel freely in Europe's passport-free Schengen area. The Commission said there was a lack of "transparency and oversight" of the residence schemes, including too few statistics on how many people obtain a residence permit in this way. The Commission warned "it will take necessary action as appropriate" if member countries fail to comply with EU law and rules on border checks, money laundering and tax avoidance. The problem of "golden visas and golden passports" has been flagged by non-government organisations. In October last year, Berlin-based Transparency International and London-based Global Witness called EU citizenship and residency as "just like a luxury good" which "can be bought". "By their very nature, golden visa schemes are an attractive prospect for the criminal and the corrupt," they wrote. They said Spain, Cyprus, Portugal and Britain are the countries that have received the most investment in return for visas. Spain received 976 million euros annually compared to 498 million euros in Britain.